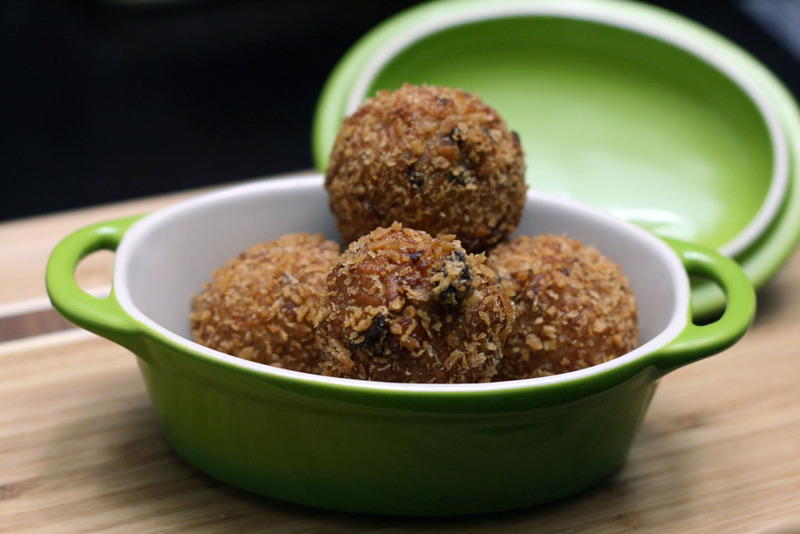 So now that you have some "leftover" risotto, the best dish to make is some crispy arancini! 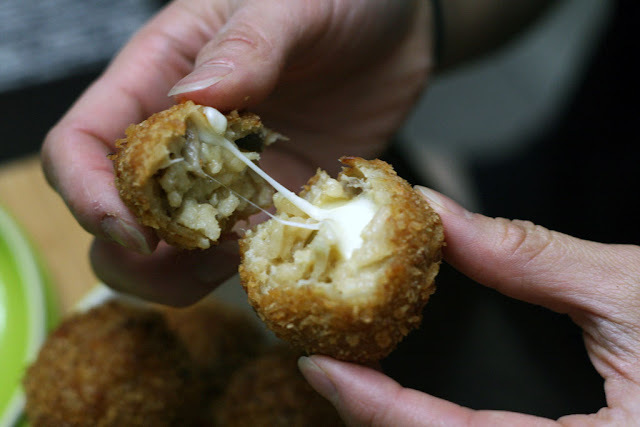 Arancini is essentially crispy fried balls of rice with some oozy cheese inside. 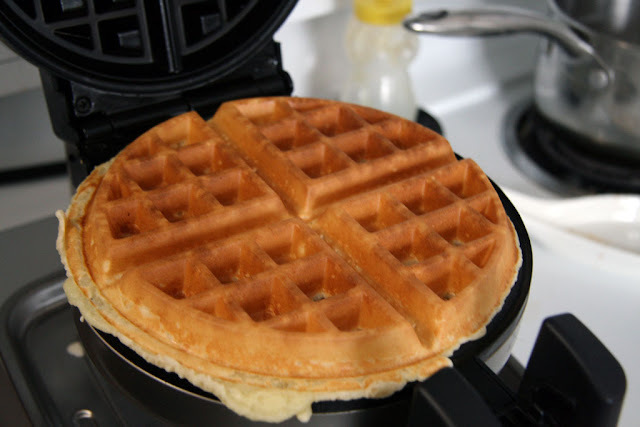 Not only is it incredibly delicious but it smells great too. 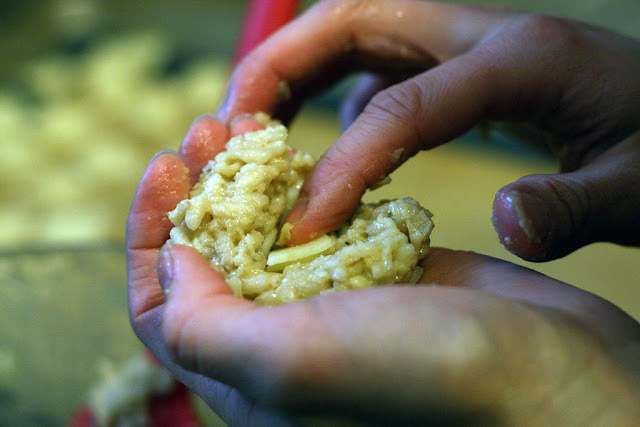 It probably is best to make risotto the day before and then turn the risotto into arancini; otherwise it would take a long time to prep and eat dinner. You could also make everything in one go, but you would have to ensure that the risotto is cooled completely (lay it flat on a pan) before using. 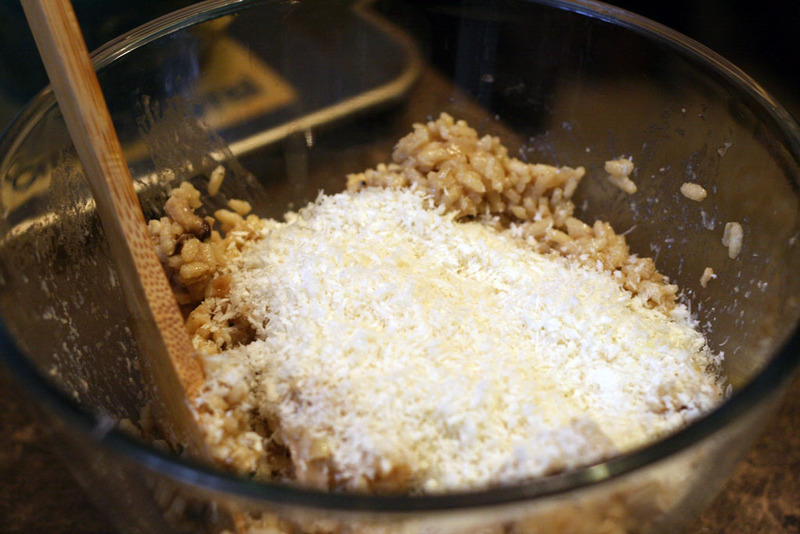 Combine the cooled risotto in a bowl along with the pecorino romano and panko. 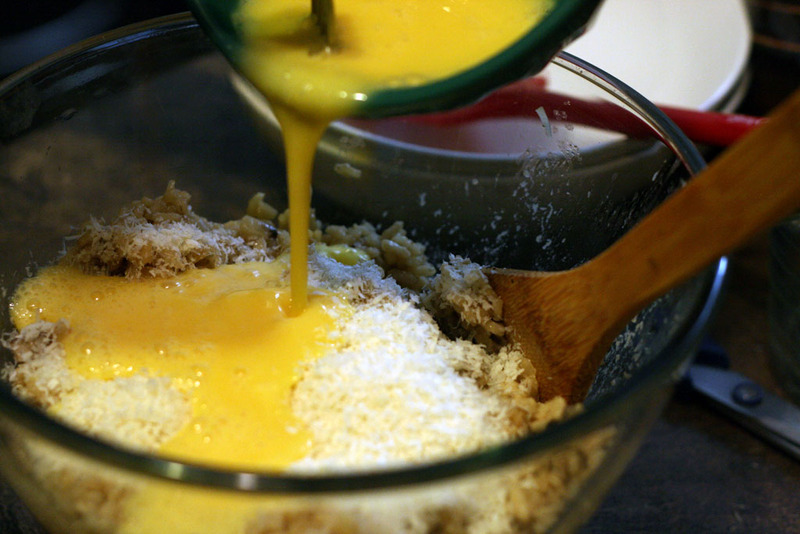 Add the beaten eggs all at once and mix well. Once all the ingredients are incorporated, spoon 1 tablespoon balls of the mixture into your hand. Gently flatten out the ball into the palm of one hand and using the index finger of your other press the cheese into the middle of the ball. Using both hands cover up the cheese and roll into a ball. 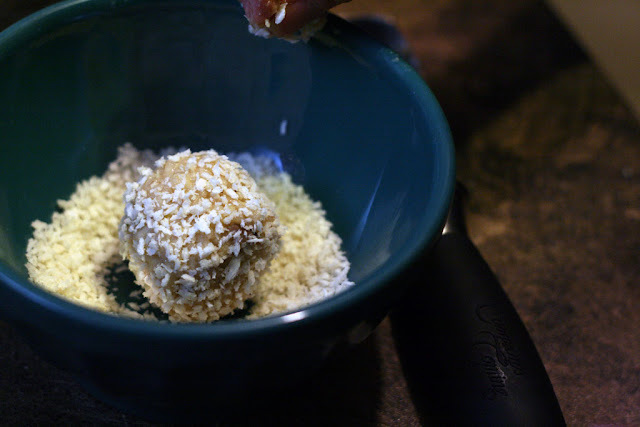 Place more panko crumbs into a bowl and roll the risotto ball in the panko crumbs. Set the rolled ball onto a lined baking tray. Roll the rest of the risotto mixture. To cook the arancini, work in batches (about 3 or 4 at a time) and fry the arancini in the deep fryer for 5-6 minutes or until golden brown. If you don't have a deep fryer, fry the arancini in heated oil for 4-5 minutes or until golden brown. Once cooked, remove the arancini from the oil and drain on a paper towel. Top with more shaved pecorino romano before serving! That's all you need to have some crispy fried arancini at home! 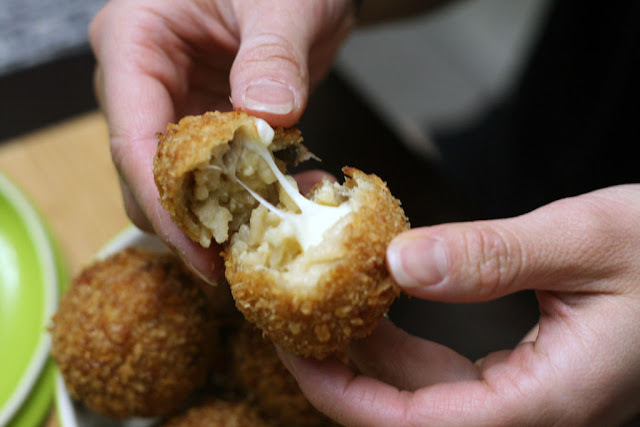 Feel free to try using different types of cheeses for various arancini flavours! 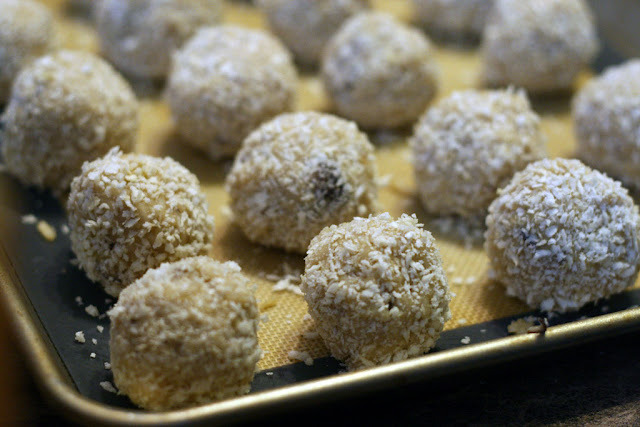 You can also make a different type of risotto at first and then make them into arancini. Most of all, have fun and enjoy the food! Oh yum!! 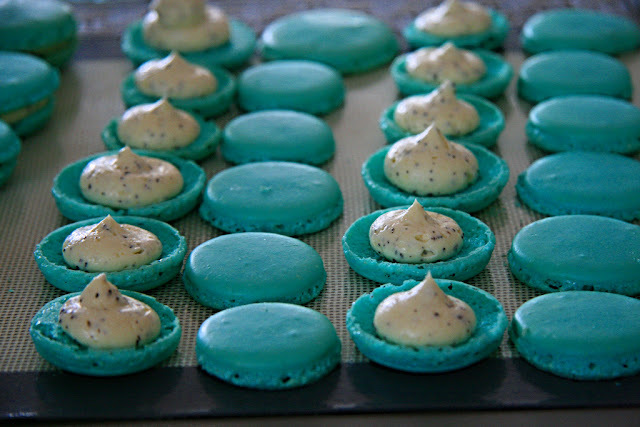 These look super tasty. Do you think it would also work to bake them? Your arancini look wonderful, nice and crispy on the outside, melted cheesy goodness inside. We do the same with our leftover risotto :-) . goodness! how did I miss this awesome comment from you!!? I seriously need to fix the comment issue on this blog!